When not attending to the day-to-day duties of managing our practice, Hayley is busy navigating all the complexities of electronic billing procedures required in a modern eye care practice. She is very familiar with most insurance plans including Medicare, MassHealth and BlueCross BlueShield. 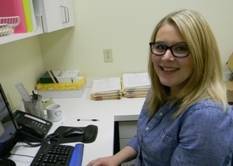 Hayley will also be delighted to assist you when necessary to get a referral from your PCP, prior authorizations from your insurance company and to assist you with any questions regarding insurance and billing matters.